I would like to change the order of the columns in the details view, how to make it? Just drag and drop the column label left or right – to the position you want. Alternatively you can use the Column profiles to reorder the columns. I would like to customize the columns in the detail view, is it possible? To customize the columns, open the Settings (F12), go to “View → Column profiles” and select one profile name then click on “Define columns” button. In this dialog you can use the buttons to add, remove, or move any column. I would like to display different columns for my folders with images, is it possible? 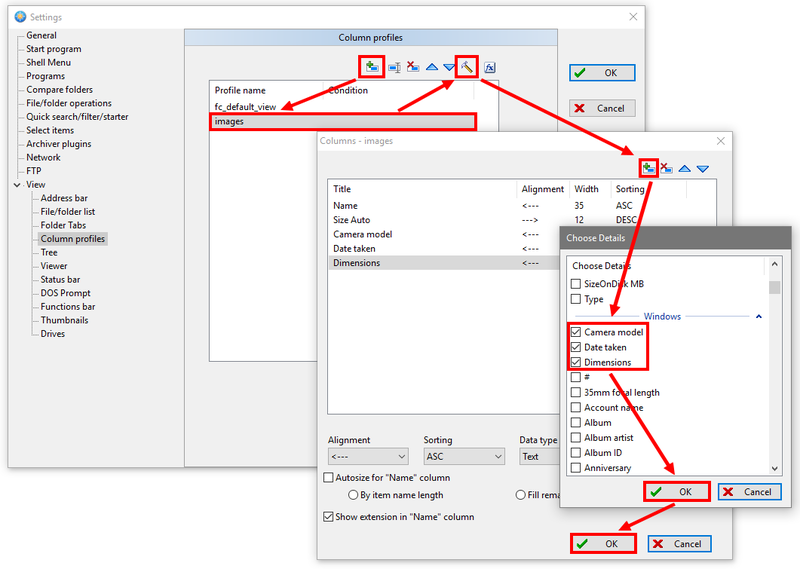 In the “Settings (F12) → View → Column profiles” create new profile by clicking the “Add new view” button, typing the profile name, then click the “Define column” button and customize the columns you want to use for images. If you want to use this profile automatically, when you browsing the images, in the “Settings (F12) → View → Column profiles” select the profile name and click the button “Condition”, then choose “Folder name ” and add the folder(s) with your image files – or use “Folder name ” and add the folder name(s) there. Note: When using “Folder name ”, you must move the column profile above the profile without condition, using the “Move Up” button. I like the “Plain view” mode, but I would like to see the column with the path in Details view, is it possible? Yes, it is, open the “Settings (F12) → View → Column profiles” and create new profile, click the button “Condition” and select “Plain view <plain>”. Then click the “Define columns” button and add the column “Path” to the list of columns. You can remove some columns or/and move the “Path” item up in the list, if you want. I have defined multiple column profiles with conditions, they are changing automatically when I change the folder, but sometime I would like to use another set of columns – is it possible? Yes, it is, change the condition option to “No condition <fixed>”. FreeCommander displays the file extension with the file name, but I would prefer a separate column for the file extension. How to change it? Open the Settings (F12), go to “View → Column profiles” and select one profile name, then click on “Define columns” button. 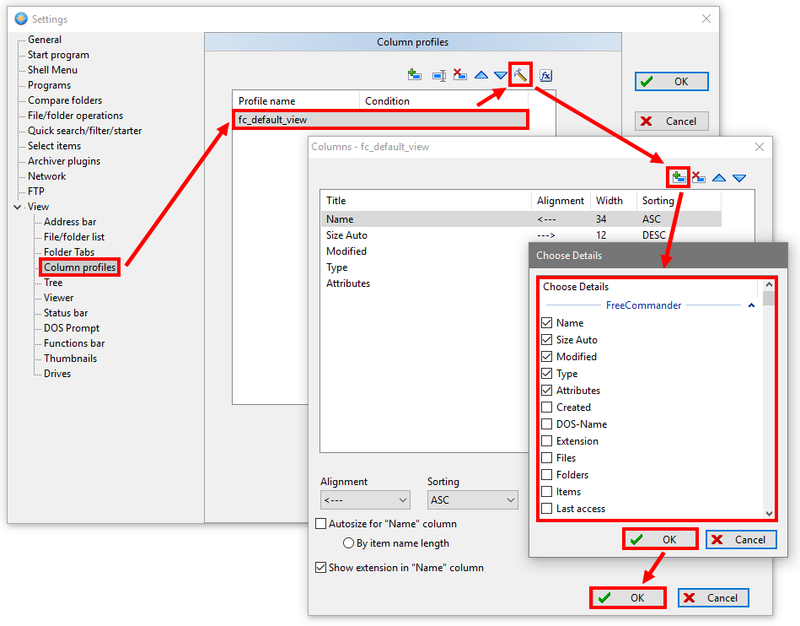 Then uncheck the option “Show extension in “Name” column” and use the “Add new column” button to add the item “Extension”. Finally, click the “Extension” item and use the “Up” button to move the item “Extension” below the “Name” item. The file name is displayed with the extension – I like it, but it is possible to see the extension right justified in the column? Open the Settings (F12) and go to “View → File/folder list → General” and check the option “Right align extension for details and list view” here. How can I switch the Details view to another defined column profile? In the main menu select “View → Column profiles” and choose another profile. I would like to limit the max. width of the “Name” column – how to make it? Open the Settings (F12), go to “View → Column profiles” select the profile name and then click the “Define columns” button. Then select the “Name” item and change the value of the “Width” option. In Details view the text in the “Name” column is not fully visible sometimes, how to change it so, that it will be always fully visible? Open the Settings (F12), go to “View → Column profiles” select the profile name and then click the “Define columns” button. Then check the option “Autosize for ‘Name’ column” with the suboption “By item name length”, select the “Name” item, and change the value of the “Width” option to “0”. Can I change to color of the sorted column? In the “Settings (F12) → View → File/folder list → Sorting” check the option “Shadow sorted column”. If this setting is checked, the sort column is shaded. Note: If the background color is very light, the shading may be hard to distinguish. In the “List view” mode I would like to limit the width of the displayed text – is it possible? In the “Settings (F12) → View → File/folder list → General” define the value within the field, next to the option “Max. column width for list view”.